This is the first of a two part series on encouraging verbal communication in young or speech-delayed individuals through play. This section covers how to encourage verbal communication in general. The other one can be found here. One of the most common concerns I see posted on parenting message boards is lack of or delayed speech. It is common for even well educated individuals to respond glibly with statements such as, “Einstein didn’t talk until 4. Nothing can be done to help speech until age 2. If your pediatrician isn’t concerned, then you shouldn’t be concerned.” If you have concerns about your child, especially if they are between 4 and 60 months and score in the black on the Ages and Stages Questionnaires [PDF for the master list] then put in a referral to Early Intervention. Even if your child never qualifies for speech therapy, there is plenty you can do to build a healthy environment to encourage speech. I was inspired to write this guide after seeing so many parents told to just wait it out. While most of what I’ve learned about speech has been drawn from books meant to help my autistic son, the techniques have really helped my son’s neurotypical twin as well. If you do have a young child with autism, I can’t recommend An Early Start for Your Child with Autism: Using Everyday Activities to Help Kids Connect, Communicate, and Learn [affiliate link] highly enough. As my sons just recently turned 3 and this set up works well for us now, this guide, especially the set up of the play area, may not be as helpful for parents of much older children, but the basic principles will remain the same at any age. You can start as early as 2 months, when most children are babbling and responding back to your communication. A lot of people, even trained ABA therapists, approach learning in a way that discourages it. They study the child to see where the child is behind, make a decision to teach the child X, then try to push X on the child without any regard for the child’s interest in X or in their manner of teaching X. I’ve heard of therapists trying to teach a toddler to identify and name colors by forcing them to sit in a chair and point to colored flash cards while refusing to let them leave the chair until they’ve identified an appropriate number of colors. This way might result in a child who learns their colors, but it will be far more of a battle compared to when learning is kept fun and in the context of play. Think of how much easier it is for you to learn the rules of a complex game compared to a complex textbook problem. If learning is kept fun, the child will engage with you for far longer and on a wider variety of subjects. In The Spark: A Mother’s Story of Nurturing, Genius, and Autism [affiliate link] , Kristine Barnett writes about how she was told that her son might never learn to tie his shoes. His therapists wanted to put aside his favorite tools in order to focus on memorizing rote actions designed to teach him tasks like tying his shoes. She found this approach entirely backwards. As she explains in her book, if you lived in a fabulous tree house and people were constantly trying to drag you out of the tree house to engage in boring tasks, you wouldn’t want to pay attention to them, would you? You are much more likely to engage with someone who will play with you in the tree house first or demonstrate the tasks inside the tree house. A very simple way to encourage speech is to follow the child around and narrate their actions. For example, whenever my boys get on their trampoline, I chant, “Jump! Jump! Jump!” in time to their jumps. As the authors of NurtureShock: New Thinking About Children [affiliate link] note, pointing things out isn’t nearly as helpful as letting the child play and describe what they point to or pick up because parents often make mistakes when they make assumptions about what the child is trying to say or paying attention to. By following your child’s interests, you can gain more confidence about what currently has their attention. At the same time, don’t feel that you must be speaking all the time. Constantly talking to your child doesn’t help language acquisition nearly as much as responding when the child initiates it. Even physical touch can help. Give your child breaks and alone time to babble since intermittent reinforcement is more powerful than constant. It’s also very helpful to regularly speak on the same or just above the child’s level, especially speech delayed children. If the child isn’t saying any words, use a lot of one word sentances. Once they start saying words, then you start using two word sentences, and so forth. Children tend to love silly voices and exaggerated words. Often parents think that they must speak the word as clearly as possible, but I’ve found better luck when I exaggerate some words in order to make them more fun and interesting. For example, when the boys are pulling on something, I stretch out pull and put a bit of stress in my voice to emphasis the combination of word and action. I taught them up and down by holding them up high and saying “up” in a high pitched voice, with down the reverse. Even now, they think it is a fun game to jump up while saying, “Up!” in a high voice and “Down!” while crouching down. Animal sounds and sound effects are great first words because of their naturally fun nature and how easy they are to make. As one of our speech therapists often said, “If you can spell it out, its a word.” Whee! was an early word for both boys because they quickly learned that if they said it, daddy would toss them in the air. As the author of Talking Kids notes, “[t]he key is to find something your toddler loves and then use the magic words over and over right before the fun begins”. We taught the boys to count by playing a game where we pretend to sleep on the floor and, with our eyes closed, slowly count to 3. After 3 is reached, we ‘wake up’ dramatically and tickle them. My boys love this game so much, they will start counting as soon as I get in position on the floor. Another technique that helps is to pick out languages that help your child best say the word they are trying to say. Follow what is easiest for your child to manage. For example, both boys struggled with saying airplane, but they could sign it easily, so we used the sign first, then moved to the word. Grapes were very hard to say and scaffold, which is when you start with part of the word and later add more to it. An example of a great word to scaffold is motorcycle, since we could go “moto” -> “motor” -> “motorcycle”. Grapes would be apes -> rapes -> grapes, so we started using “uvas” instead because both boys could pronounce it fairly well straight away. The more words your child has, the easier it is for them to expand their vocabulary further. My autistic son, Corwin, learned to identify and name parts of my car before he learned to identify and name members of our family. He could pick out a backhoe and a grader before he could pick out his colors. 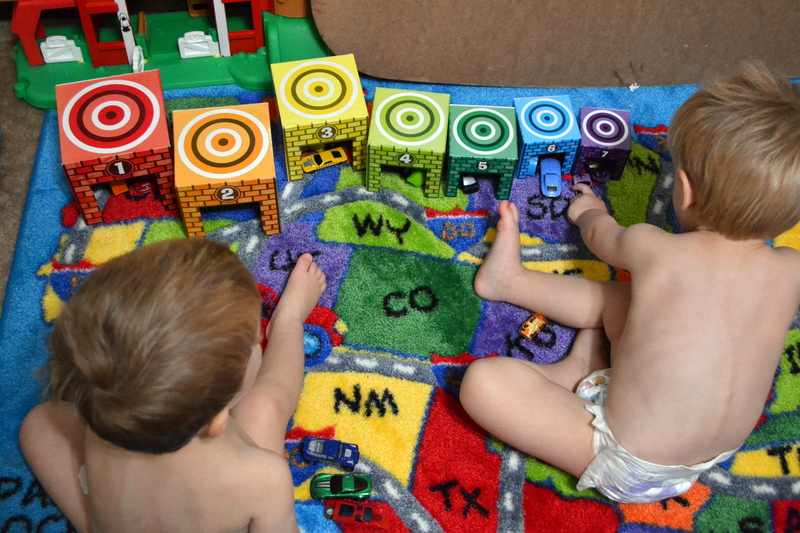 We used his love of vehicles to teach him about colors and numbers. Once he learned how to say, “yellow bus” he was soon describing other yellow objects. At the same time, some toys and actions can interfere with your child’s ability to interact with other individuals. Like many children with autism, my son is obsessed with toys that make a noise or a song when you push a button. It took us a while to realize he was fixating on the toys in such a way that made interaction difficult. When we tried to play with him with some of these toys, he would work to prevent us from sharing the experience because we were interrupting the particular pattern he wanted to hear. On the advice of a speech therapist and An Early Start For Your Child With Autism, we removed batteries from nearly all of our toys and got rid of the push button/play sound toys. As the speech therapist pointed out, the boys are more likely to make the vehicle sounds when the vehicles aren’t making the noises for them. It’s important to select toys that encourage communication rather than discourage it. We also removed all toys that could only be played with one particular way unless we were using that toy in a particular therapy session. An Early Start has a wonderful guide to selecting toys that encourage communication and joint play. Amongst others, they suggest blocks, crayons, dress up clothes, play dough, books, swings, stickers, dolls, etc. Your participation should be easy to integrate. It’s important to select toys that allow you to participate in play, especially for autistic children, because this joint participation is most conducive to learning. We’ve had a few speech therapists due to moves and our best one was absolutely amazing at getting my son to learn words because she found opportunities for language and joint play in almost every type of toy or activity. Something like a swing might seem limiting at first, but there is a lot you can do with a swing. You can pull the child up high and say, “Ready… set… go!” and release them just after the go. You can have them give you high fives as they swing towards you. You can pretend that their feet are kicking your hands with upstrokes. Finding the right combination of toys can really open up a child’s language. At the same time, simply having the toys that your child enjoys on hand won’t be enough if your child can’t concentrate for other reasons. For autistic children especially, it is important to get enough sensory stimulation or understimulation so the child can concentrate. Some child need a bland, quiet play area, while others will do better if given lots of items to touch and bounce between. Both of my boys get sensory diets with lots of physical exercise and tumbling. Language doesn’t necessarily need to come after sensory needs are met. Integrating language into sensory activities is a great way for children to learn how to ask for their sensory needs. To encourage the child to look at your mouth, find their comfort zone and place yourself in it. For children with autism, you will have to be more careful about where you sit since many children with autism find eye contact too intense to maintain for long if at all. I encourage my son Corwin to look at my mouth, but not my eyes, because I can tell it bothers him to look at my eyes, especially when up close. When Corwin requests games like Itsy Bitsy Spider, I sit farther back than I do with his twin, Alden. When I read books to them, I either sit facing them with the books near my mouth, or I sit one in my lap and we take turns pointing at things and discussing what we see on the page. When I sign, I sign with my hands as close to my mouth as possible so the boys can see the combination of mouth and hand movements. While I’m not someone who completely eschews screen time for children, especially since an app helped teach my son to point, and many autistic children learn to speak through ipad apps, it is important to note that television can be very detrimental to language learning, even if it is only on as background noise. And while I do have a few pandora playlists for the boys, I try to keep them on just in the car or when we don’t have the ability to fully work on joint activities. When we are traveling or waiting at the doctor’s office, I like to use apps such as Peekaboo Barn and Endless Alphabet because I can interact with my boys with the apps when I have a moment, but they sustain interest when I can’t give one on one attention. Another way to reduce competition for your attention is to limit the number of toys available. In An Early Start, they recommend having only 6-8 types of toys available and rotating through them frequently. With many toy options, it is harder for children to concentrate on the task at hand and for caregivers to understand which exact toy the child wants. As caregivers learn to read children, children learn to read them as well, which can inhibit communication because a lot of actions are done on assumption without waiting for prompts. In the excellent book on Engaging Autism: Using the Floortime Approach to Help Children Relate, Communicate, and Think [affiliate link] the authors talk about how reducing verbal communication can really help promote nonverbal communication in an autistic child. They say that parents are often hesitant to do this because they fear it will hurt the child’s overall communication, when the opposite is true. Often times, we attribute more understanding to our children than they actually have and talking a step back can help us recognize their weaknesses. Imagine you are about to go to the store with your child. As you are getting ready to leave the house, you say to your child, “Put on your shoes, we’re going to the store.” When your child does so, you might assume that they understood what you told them. In fact, the child might have seen the keys in your hand and assumed that shoes would be the next logical step. When Corwin was diagnosed with autism, he showed no receptive language, which means he didn’t understand any words; however, he knew that if I put on his jacket, he should go get his shoes because we were about to go out the door and he needed his shoes to leave the house. In order to teach children with autism how to read nonverbal communication, we reduce prompting as much as possible, which means that we reduce verbal language so the children are reliant on our nonverbal language. To do the reverse, you remove as much nonverbal language as possible. Many parents overestimate their children’s receptive language, especially in very young children. They speak a long sentence and their child appears to understand all of it, when the child had simply reacted to a word or two and the context of the sentence. A child needs to first have receptive language (how much they understand) before they can have expressive language (how much they can speak). Testing your child’s receptive language can reveal weaknesses that might remain hidden otherwise, so reducing nonverbal communication can help you spot weaknesses within verbal communication. Along these lines, another thing that parents can do to encourage speech is to put in communication opportunities for children in play so that greater interaction is needed order for play to occur. That brings me to the second half of this piece: setting up the play area.